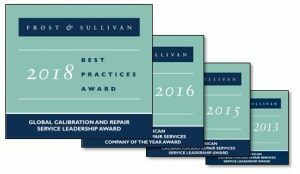 June 6, 2018 - Frost & Sullivan, a leading independent research firm, has awarded SIMCO the 2018 Global Calibration and Repair Service Leadership Award. Based on their industry research and analysis, Frost & Sullivan found that SIMCO provides an “unmatched customer service experience” and leads the industry in speed/timeliness of service, advanced quality execution software, and consistent global service. Read the press release. SIMCO was also awarded the Frost & Sullivan 2016 Company of the Year Award for North American Calibration and Repair Services as well as the Frost & Sullivan North American Calibration and Repair Services Service Leadership Award in both 2013 and 2015 (biennial award). To download a PDF file of the full Frost & Sullivan Service Leadership Award report, click here.